We’ve all done it–bought shoes and completely forgot until it was too late that brand new shoes HURT if worn for long periods of time. Don’t let the excitement of your wedding day be marred by pain and blisters. Here is how to break in wedding shoes before the big day, as well as which techniques you may want to avoid. Wear the shoes for progressively longer periods of time. A few hours wear around the house will certainly help, but most experts recommend a longer break-in period, especially if you are not accustomed to wearing the type of bridal shoe you’ve chosen. Think of it as preparing for a marathon. Begin training in short bursts and gradually work up to the full distance. Your “full distance” will be the time it takes for the ceremony, reception, and any activities after. Wear your shoes off and on around the house for three or four weeks. This will help break them in gradually. When the shoes are comfortable after an hour’s wear, begin keeping them on until they hurt. 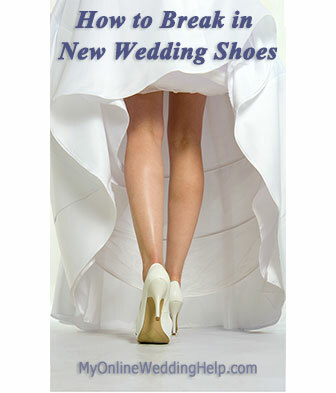 Gradually increase the time over a month until you can wear your bridal shoes for several hours with no blisters. Add extra padding where needed. If your heel slips, add back of heel cushions inside the shoe. For more comfort at the balls of your feet or soles, buy cushioned insoles. Use bunion pads or gel dots to relieve chafing in specific areas. If the shoe is too tight around, consider using a shoe stretcher on it. What about applying heat or cold, or rubbing something into the shoe to make it stretch? There are other ways to make your shoes more pliable or stretch them out a bit where they are too snug, but consider the risks before taking any of the following actions. These may be quicker than gradually getting the shoes accustomed to your feet, but there is more danger of disaster. These are your WEDDING shoes that must look pristine, not sneakers that will quickly get marred anyway. Use a blow dryer. The idea behind this method is to stretch the shoes with your feet in them (as opposed to with a stretcher) so they better mold to your unique foot shape. First put on some thick socks, then wedge your foot into the shoes and walk around to figure out where they are the tightest. Blow hot air on those areas to loosen the shoes. Walk around some more until the shoes are cool. Voilà, the shoes are instantly broken in. Unless the shoes are made from a meltable material, in which case it can mean instant disaster. Use rubbing alcohol. Some people swear by rubbing alcohol as a way to quickly stretch shoes. Saturate thick socks in the areas that correspond to the tight places on your shoes before putting on the shoes, then walk around until the socks dry. There are also special shoe-stretching sprays that could be used instead. I’m interested to know if this works, as I cannot think of any risk involved with the approach, beyond accidentally spilling the alcohol all over the shoes and staining them. Use a microwave. A variation on the blow dryer method is to put the shoes in the microwave for about 15 seconds to soften them up (instead of blowing hot air) before fitting them over your sock-thickened feet. Great idea. Unless those shoes have hidden metal, in which case they will spark, possibly creating scorch marks. Use an oven instead of a microwave. An oven would avoid the problem with hidden metal, but you are back to the melting issue. At least with a blow dryer you can see the melt when it begins and stop while there is still minimal damage. Use ice. When water freezes it expands, so if you fill your shoes with water and put them in the freezer they will stretch overnight as the ice pushes from the insides of the shoes. To accomplish this, pour enough water into two freezer bags so they will fill your shoes. Press out all the air from the bags before sealing them (otherwise the water will expand up into the air space instead of out against the shoe). Then place bags in shoes and shoes in freezer. The next morning, take them out of the freezer and let thaw until the ice has melted enough to pull the bags out of the shoes.This method has potential. Unless your particular shoes don’t stretch when cold and, with nowhere to expand, the water pushes the bag open. Or one of your bags has a slow leak. In either case, the shoes end up wet and perhaps water stained.